I love everything about this apartment! This 426 sq. ft. apartment makes the most of its minimal footprint and incredible height by using the vertical wall space for extra storage. A large curtain hides their shelving while simultaneously adding an elegant white wall to the kitchen,dining and living room spaces. 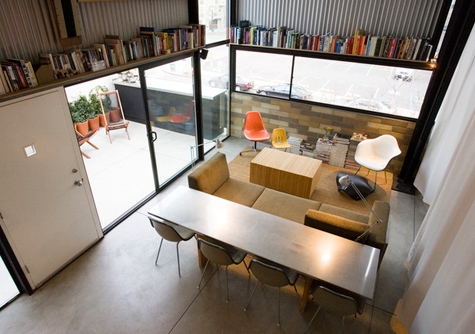 "Upon deciding to move in together, we were confronted with the difficult task of combining the components David's 800 square foot loft with the pieces my 550 square foot apartment into our new 426-square foot downtown loft. Fervent collectors and fanatical organizers, we had a couple extra hundred dollars a month, a table saw, and a friend's metal shop to realize our new home together."